According to the Washingtonian, otherworldly metal heroes GWAR will be turning the Washington, D.C. area's Rick And Morty-themed bar into their own GWAR Pub, starting this week. Evidently Turner Broadcasting, the parent company of the animated show, has threatened legal action against the current pop-up bar's owners so as part of their agreement, the owners "agreed to destroy all their Mr. Meeseeks, mega trees, and other fan art," which is where GWAR comes in. On Thursday, September 6 the band will come in and "kick some things around, and break some things". That evening a portion of the bar will reopen as the GWAR Pub, with various GWAR memorabilia now adoring the establishment. 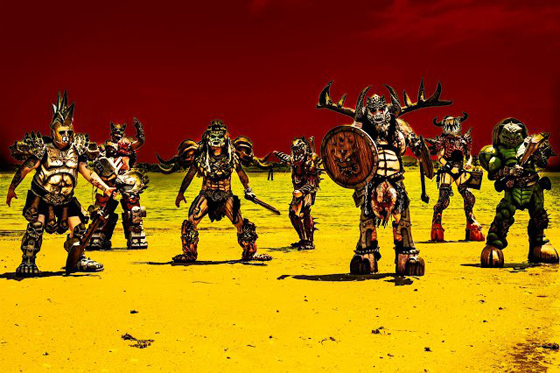 The new GWAR Pub Pop-Up will also feature a cameo appearance on opening night by GWAR. The pop-up will run through October, culminating in a GWAR-themed Halloween party. They'll also have themed drinks, a limited edition Oderus Eternal tiki mug and various assorted GWAR merchandise for sale. Read the full story, courtesy of Washingtonian, at THIS LOCATION.